Switching from Diva, Lunette, Ulta, Lena, Saalt or other Brands to MeLuna? We are sorry your last cup didn't work out for you but super excited that you found us! If you are coming here, it's likely you have first tried a brand that only offers two cup sizes. Those are often designated as pre-baby and post-baby sizes. Are you switching to MeLuna because your previous cup was too long? 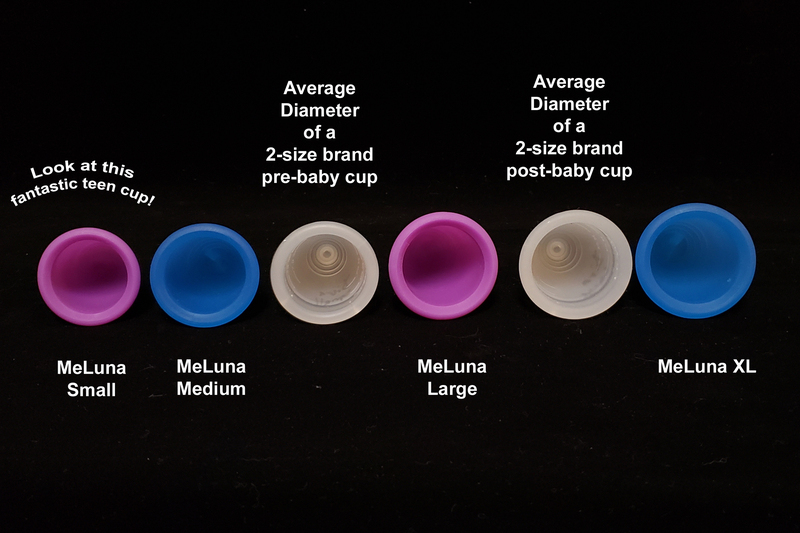 If your Size 1 (pre-baby) sized cup from another brand fit well in regards to diameter (no leaks and no discomfort in regards to rim width) but simply was way too long, the MeLuna Shorty Medium or Shorty Large could be a good option for you. If your Size 2 (post-baby) sized cup from another brand fit well in regards to diameter but simply was too long, the MeLuna Shorty Large or Shorty XL could be a good option for you. Was the previous cup just a tad too long? Even our standard MeLuna menstrual cups are a little shorter than really long brands, like the Diva Cup. We're here to help via chat or email, if in doubt! Don't hesitate to reach out to us.